Last winter, Sibel visited Santa Fe and I showed her the town, and a television crew from the German travel show AFTER DARK filmed our adventures. More recently, I visited Hamburg, Sibel's home town, and she returned the favor (without the TV crew). I blogged about that below. 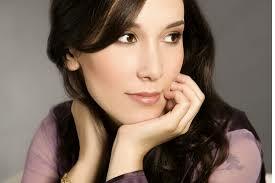 There's a lot more to Sibel Kekilli than just Shae, though. She has twice won the Lola for Best Actress, the German Oscar, for roles in feature films, she is presently one of the stars of the long-running German police procedural TATORT... and she has long been politically active, speaking out on controversial subjects, most notably the treatment of women in traditional Islamic culture. Recently she was invited to the German "White House," where she addressed that subject once again in a speech before Joachim Gauck, the president of Germany. Some of the things that Sibel and Terre Des Femmes fight against are dramatized in A SONG OF ICE AND FIRE... but, sadly, they are not just fantasy, but real problems in the "enlightened" modern world we live in. I applaud Sibel for her courage in speaking out against them... her words have come at great personal cost, I know, and made her a lot of enemies... but as someone wiser than me once said, all that in necessary for evil to triumph in this world is for good men (and women) to say nothing.